Kimberly Wilson at the Darien Historical Society on Feb. 5. DARIEN — Kimberly Wilson doesn’t need a slideshow presentation. “I am the point of power,” she said as she toured the exhibit floor of the Darien Historical Society. 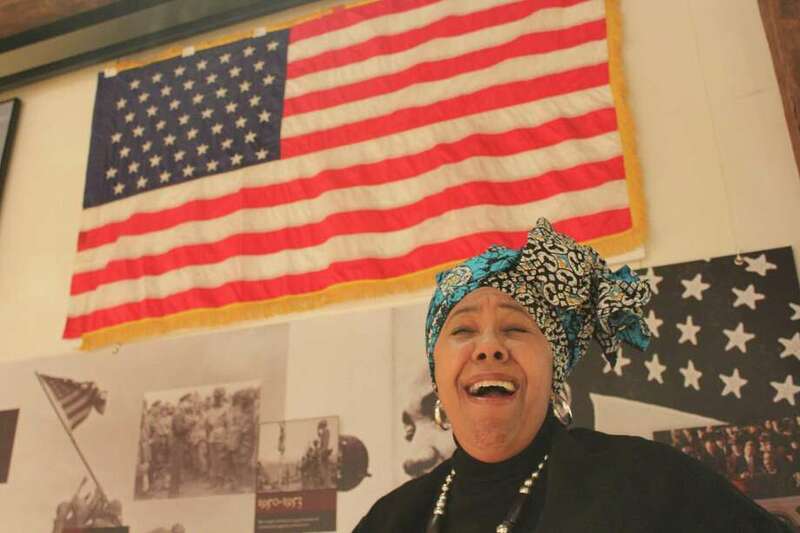 Wilson’s musical show, “A JOURNEY: A Musical One-Woman Show” tells the stories of prominent African-American women — from the African Queen to Rosa Parks to Maya Angelou — through songs and acting. “Art is a living thing and it can be anywhere. I bring seven women and bring it to the people wherever acting is welcome,” Wilson said. The idea for the musical steadily developed but it started out when Wilson portrayed Sojourner Truth at a Black History Month event over 20 years ago. “I began adding characters and creating more opportunities to bring music. I wanted to create a full-length piece to go into schools and to tell these stories of wonderful women in history,” Wilson said. Faithful to its title, the musical is a testimony not only to the African-American experience but also the roots of African culture. Cost: $10 for members and $30 for non-members. “The historical African Queen starts the story. The story of African culture begins well before all those people were stolen and kidnapped from their homes. I want to focus on people so they can understand that when they look at a black person that our history is not of slavery, our history is rich, our history is culture and yes, displacement is part of our story, but it isn’t the beginning, it’s part of the journey,” Wilson said. Margaret McIntire, executive director of the Darien Historical Society, was acquainted with Wilson’s performance from her time at the Mark Twain Library in Redding. Throughout the years, Wilson’s one-woman show has become more personal and she interweaves her own story with that of her female idols. “I used to end with Maya (Angelou) but the audience would say ‘don't’ stop, we want to know about you’ and eventually I wanted to reveal my truth and open it up for people to share theirs,” Wilson said. Wilson, originally from Minneapolis, Minn., has been a Westport resident for 25 years. As a college student at Howard University, Wilson would visit her sister in Redding, Conn., where she eventually “fell in love” with the state, prompting her to move to Fairfield County. “A Journey” is meant to inspire and to encourage people to converse about their stories and passions. “The more we share the stories of our community, the more we share their value and their history,” Wilson said. Wilson will be performing her one-woman musical “A JOURNEY” at the Darien Historical Society on Feb. 11 at 3 p.m. The cost is $10 for members and students and $30 for non-members.